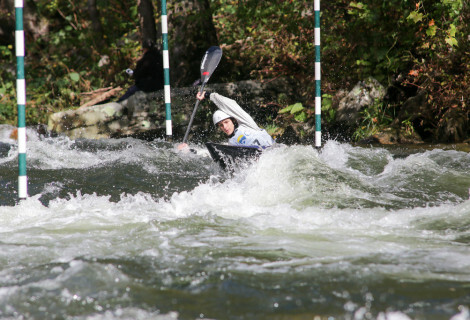 Let’s face it: whitewater kayaking is not (yet) our national sport. Our sport remains obscure in America for number of reasons. Partially due to it’s small size, access to equipment, training sites, coaching, and peer groups is often a challenge. But some of NRC’s youth members, and their parents, are willing to push through the obstacles to pursue the sport they have come to love. 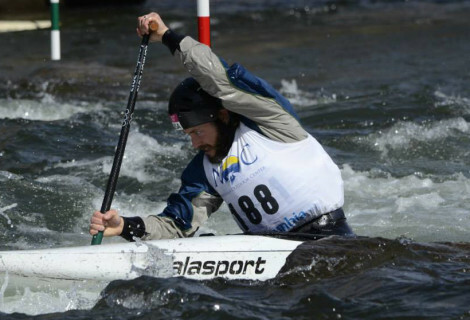 Each month in the NRC Featured Athlete section, we’ll highlight one of the exciting NRC athletes who is pushing him or herself to pursue kayaking despite the challenges. This month, it’s our distinct pleasure to introduce Lili Brandon of Fort Payne, Alabama. An NRC member since 2013, Lili is on the NRC Competitive Team. I caught up with Lili over FaceTime this week to learn more about what’s going on in the life of this cheerful, friendly, and motivated 15-year old. 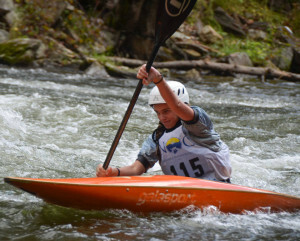 Photo: NRC Competitive Team youth athlete Lili Brandon pushes into an upstream gate during the 2015 US Slalom Nationals, hosted by Nantahala Racing Club on the Nantahala River. How long have you been a kayaker? I’ve been a kayaker for four years now. 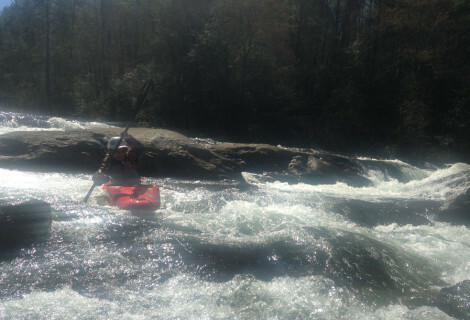 I went to the Nantahala with my family and they were letting kids try out kayaks. I tried one, and told my dad I wanted to do it, so we started going to roll practices in Chattanooga. I mainly played soccer. I was on a travel team for three years. We practiced three days a week and had games on the weekends. I do. I think it’s really fun to get to do things, to compete as a team. I’m still on a team, but I miss how in soccer, you really depend on each other during the game. Kayaking you only depend on yourself during the race. But that’s fun too. It’s different. How many days a week do you train for kayaking? Two days a week I usually go to the reservoir and other days I do stuff at home: workout videos, stretching, pull-ups, or I go to the gym in Fort Payne. Lots of weekends we go to the river, either the Nantahala or Charlotte. I know you have to travel a lot to train with the NRC team. Do you sometimes have to choose between a weekend of kayaking and doing something with your friends? I have to choose between that a lot, but most of the time – all of the time – I choose kayaking! Lately, I’ve been hanging out with my friends more because I hurt my knee. I couldn’t bend my knee at all, so I had to take some time off from the boat. You raced at the Mulberry Fork last weekend. How was that? It was a lot of fun. It was great being back in the boat. I mean, I had paddled on the reservoir once first, to make sure I could, but it was my first time back on the river. I loved it. There were quite a few people there, Max, Avery, Seu, Evy, and others. I was fourth in Juniors and second in Women’s to Seu. What’s the best part about going to kayak races? You just got your driver’s permit. How do you feel about getting your license next year? I’m pretty excited, I’m counting down the days. Do you think your parents will let you drive yourself to the Nantahala? No. (Laughing) I’ve already asked them! But the reservoir isn’t far away. How was it to be back at the Ocoee on Sunday? It was great! We practiced at the Olympic section. The water was a little low, so we couldn’t do all the things we usually do. There was an attainment at the top we usually like to do that we couldn’t. During the summer we were going that every Saturday: We would go up there and cook out and paddle. I’m not completely sure yet, but I might be going to Europe with the Leibfarths if they’re going. I’ll probably be spending a lot of time in Charlotte and the Nantahala. What kind of move have you really enjoyed working on lately? Hm, we’ve been working a lot on sweeps. A sweep up is now my favorite. Draws seem to me now, they’re not slow, but I like the sweep up better. You’re kind of sliding into the gate and out right away. It’s dynamic. What’s the trick to the sweep up that has made the difference? Having a lot more angle when I’m coming into it has helped me a lot. I think before I wasn’t coming in with enough boat angle. Do you think much when you’re paddling? What do you think about? I think I’m more of a visual person. To learn something, I like to see someone else do it, and then try it myself. Then I can kind of have a visual of what they did in my head, and that helps. What about during the race? Do you think much about your diet? Has your diet changed since you’ve started paddling? I think my diet is better now. When we played soccer, most of the time after we were finished we would go get McDonald’s and have big burgers and shakes. My family doesn’t eat much fast food. My mom cooks really healthy and I pack my lunch for school every day. What do you like to eat on race day? Does your interest in kayaking intersect much with your school work? I’d have to say it’s pretty separate. Usually when I come home I don’t have much homework, I might have to study for a test, but usually it doesn’t interfere with paddling. Right now we’re doing 9-weeks tests, so tonight I have to study a lot. Math. Is it getting harder now that you’re in high school? High school is a little harder but I like it because it’s challenging. I’m doing all honors classes. Right now I’m doing English and math. Math. I love math. I’ve always loved math. Have you read any good books lately? Can you give our readers a recommendation? There’s one book I’m reading right now, I’m not finished with it yet. It’s called Redeeming Love. But today I read the last page and ruined the entire thing for myself (laughing again). I’d have to say…one I recently saw I really liked: The Martian, with Matt Damon. What are some of your favorite non-sport hobbies? I like taking pictures. I love cooking. My favorite thing to make is crepes. (At this point, Lili’s mom, Christy, pipes up: “And we like for her to make them!”) I like putting spinach, avocado, and parmesan cheese. My favorite sweet crepe is Nutella and bananas. What’s your plan to get your dad in his boat more this summer? Ooh. He’s been talking about it recently. I think when it gets warm, he’ll want to get in the boat more. I think being with a group of people, friends, will make him more excited about it.